The original Whiplash figure owns a unique distinction in the annals of my lifelong toy collecting: he was one of only a precious few toys to somehow avoid being lost in all the house moves, toy trades, hand-me-downs sessions and various other instances where he might have been lost forever. 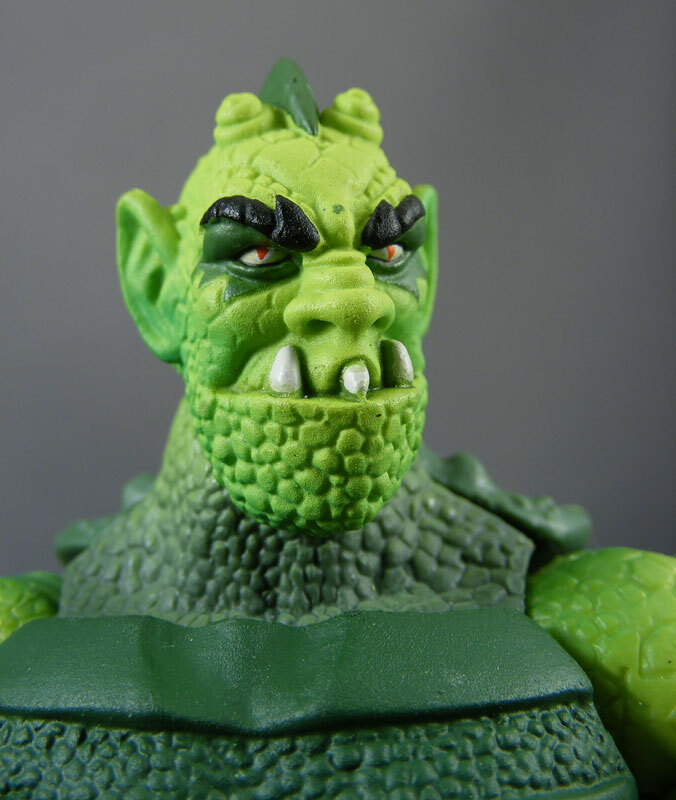 * But there’s more to the story than that: for whatever reason, Whiplash seemed to retain a certain level of quality that other MOTU figures didn’t. His green plastic never faded, he never got the greasy feel and shine from decaying plastic that occurred to many figures (particularly Tri-Klops), and even his rubbery tail never got ripped or torn. 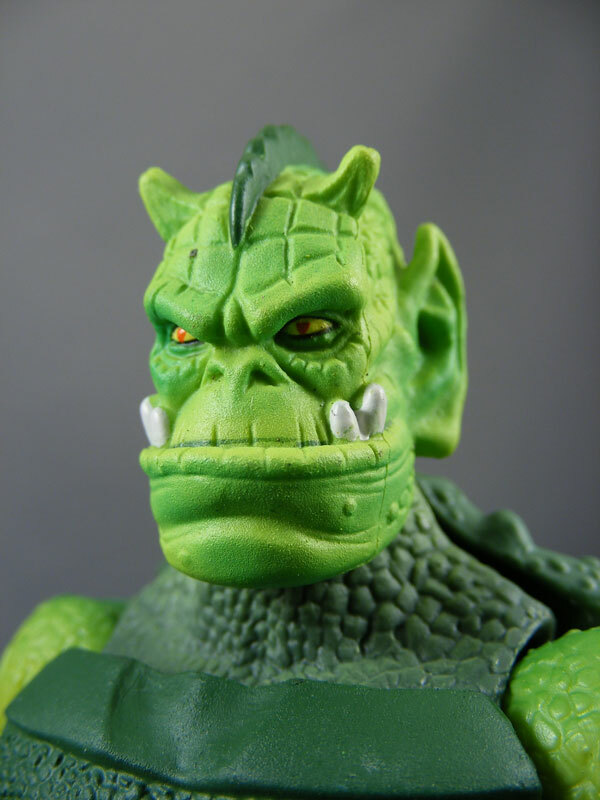 Moreover, I loved his monstrous look so much that Whiplash continued working long after young Poe had moved on from MOTU; he later battled the Teenage Mutant Ninja Turtles and the X-Men, among others. The fact is, I love Whiplash. 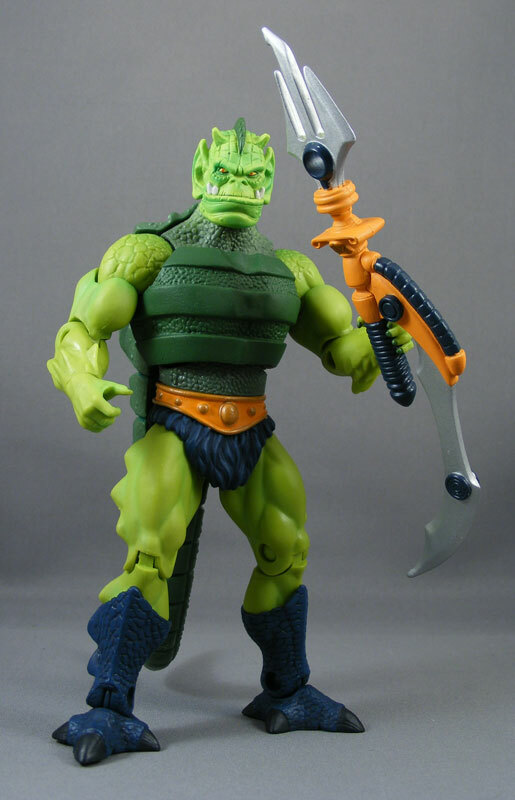 He’s one of my favorite MOTU characters, so it’s important to realize that the nostalgia factor is pretty high on this one for me. While I really liked his Millennium update (my review), I tend to think of that figure and character not so much as an “improved” Whiplash so much as a different character entirely. Packaging: If there’s anything new here, I don’t see it. That’s not to say I don’t like it, though. As the line has gone on, part of me has, more and more, missed the “big red volanic explosion” card backs of the vintage era, but I suppose it’s way too late to make that big a change–the MOC’ers would go postal. Design & Sculpt: Right off the bat, Whiplash has a huge leg up on previous figures in that he gets brand-new forearms. The “spiny” forearms we’ve seen since Skeletor have all been based on Skeletor’s vintage card art, which did not match the action figure; the art was smoother and looked less organic–it was more like a gauntlet. Whiplash’s forearms are based much more closely on the toy arms, and it’s a welcome change that automatically bumps this figure up a half-raven for me. 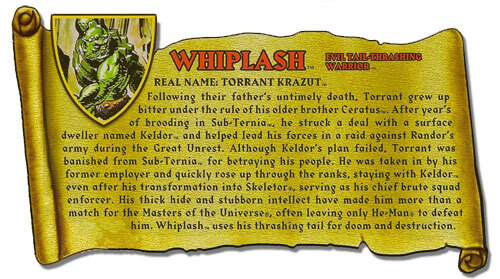 But Whiplash gets a lot more than just new arms. He also gets a brand-new torso (which is fully sculpted with scaly bumps beneath the chest armor–expect to see this used for some Snake Men), new scaly shoulders, and entirely new legs with the four-toed lizard-like design familiar from the original figure. While the biceps do not feature scales, the shoulder scales are designed so as to look like they’re getting bigger and fading away as they approach the biceps–a smart touch by the Four Horsemen. 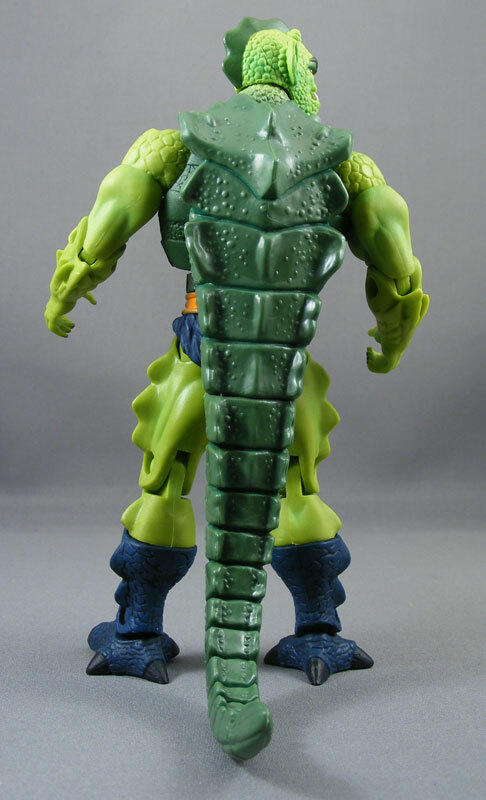 There’s also a ton of scaly detail on the Whiplash’s “boots.” It looks great, and personally I don’t think it’s so much detail that it looks incongruous alongside the less-detailed figures, but your mileage may vary, as they say. The front of the chest is covered by an armor piece that I’m pretty sure is glued in–at the very least, I’m not going to try prying it off. You can if you want to. The back section, which includes the back armor and the tail together, actually comes separate in the package and has to be attached on via a pair of large pegs. The sculpt on the tail section is excellent; the bumps and edges have been made a bit more detailed and sharpened from the vintage figure. It looks like an alligator’s back. Then there are the heads. Both of them are well-sculpted, the vintage head doing justice to the original, while the Millennium head has been properly Classics-ized–in terms of sculpt. However, you can put me down in the camp that thinks the Millennium head is just a bit too large. I’m not sure if it’s the big jaw or what, but it just doesn’t look right on the body. However, I do think a big part of why the Millennium head doesn’t look right to a lot of people is that the vintage and Millennium versions of Whiplash are just so separately distinctive, when you put one head on the other body, it’s just not going to look right. I look at MOTUC Whiplash with the Millennium head and that’s exactly what I see: a Millennium head plopped on a vintage-looking body. It doesn’t look organic to me. There’s no stylistic flow from the neck to the head the way there is with the vintage head, which has the same round scales around the lower part of the head and jaw. Not that it particularly matters to me–I was never going to display Whiplash with the Millennium head. I’m too fond of the vintage version, Abe Vigoda resemblance and all. On a final design note, I’m glad Mattel and the Horsemen went with the solid plastic & articulated tail, rather than a rubbery and/or bendy one. Plastic & Paint: Often an iffy category for MOTUC, Whiplash again proves to be a better example than usual. 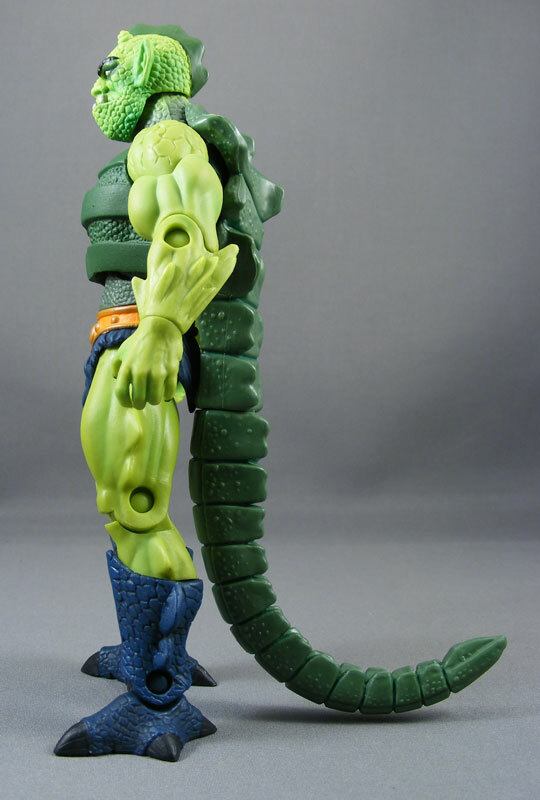 The figure’s legs and arms are molded from a pale green plastic that closely matches the vintage colors. While I like the texture of the plastic, it’s a bit soft, which means his left hand won’t hold his (axe? sword? what is that thing?) very tightly if your display location is anywhere above sixty degrees. Once again, Whiplash gets something we haven’t really seen much (if at all) in MOTUC: paint apps that aren’t just solid colors. Whiplash has a very light “fade” of dark green on the inside of both his shoulders, to represent the way his darker torso turns into his lighter arms (giving him an almost turtle-like look). The same goes for his neck, which fades from the dark green of his torso to the light green of the head. It’s a nice effect that I think puts Whiplash a bit ahead of his fellow MOTUC figures. The paint work on the heads is also fairly sharp, though there’s a bit of uneven-ness around the teeth and on the vintage head’s “mohawk.” My vintage head also has a dark green splotch right between his eyes. Looks like Whiplash needs some Proactiv. Articulation: Whiplash features: ball-and-hinge shoulders, a ball-and-socket neck, ball-and-hinge hips, hinges at the elbows, abdomen, knees and ankles, swivels at the biceps, wrists, top of the boots, top of the thighs, waist, and tail, and “rocker” ankles. My Whiplash’s ankles are tight with a good range of motion on both axes. The tail swivel isn’t perfect–it basically cuts right across the sculpt and doesn’t look good from the back when turned–but it looks fine from the front, and is a welcome touch. The ab crunch is very slightly hindered by the chest armor and tail, but it still works. Accessories: Whiplash comes with the Millennium head, his vintage spear, and his Millennium axe/sword-thing. Seriously, what’s the best word for it? I’m going to call it an axe for convenience’s sake. The spear is very simple, befitting its vintage origins, and fits snugly in the right hand. It has a minor paint application around the “blade” of the spearhead. The axe is a bit more complex. I like the design a lot–it’s a great Classics-ized version of his Millennium weapon. The entire weapon is painted, with silver on the blade portions, teal highlights and orange throughout. The orange and teal paints are applied a bit sloppily, which was disappointing; why wasn’t this molded in orange plastic? The biggest problem, though, is Whiplash’s aforementioned inability to hold on to the axe. Unlike Skeletor and other characters with the open clawed hand, Whiplash’s hand is made from a fairly soft plastic that refuses to hold the axe tightly. He’ll hold it tight initially, but eventually it’ll loosen up around the handle until the slightest jostle will make it drop. You might be able to fix the problem a bit by warming the hand with a hair dryer, tightening the grip and then dipping it in ice water, but given how soft the plastic is I suspect this won’t work as a long-term solution. It’s not a huge disappointment–with enough finagling, I can still get him to hold the axe–but given the fact that the axe was specifically designed to be held by the large hand, it’s a shame Mattel didn’t work to ensure the hand was made from firmer plastic. Quality Control: Other than that spot of paint between the eyes, there’s nothing I’d consider an actual QC problem. Overall: Whiplash has gotten some so-so reviews, and I have to admit I’m kind of surprised. With a surprising amount of new tooling, two weapons, an alternate Millennium head, and an articulated tail, I think Whiplash is the best regular-scale MOTUC figure this year after Trap Jaw. 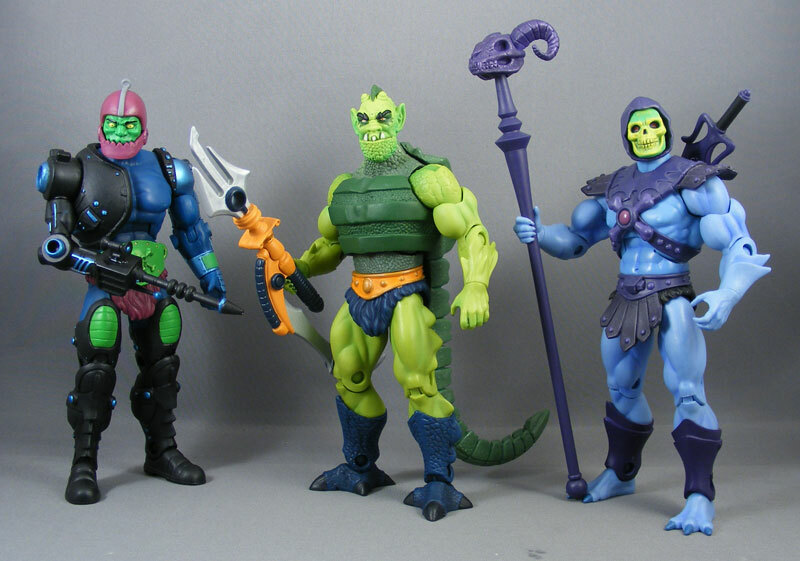 My interest in MOTU has been in a bit of low cycle lately–fear not, I’m not anywhere close to even considering dropping the line, I’ve just been focusing on some other interests lately–and while Orko, Prince Adam and Mo-Larr didn’t do a whole lot to revive that interest, Whiplash did. 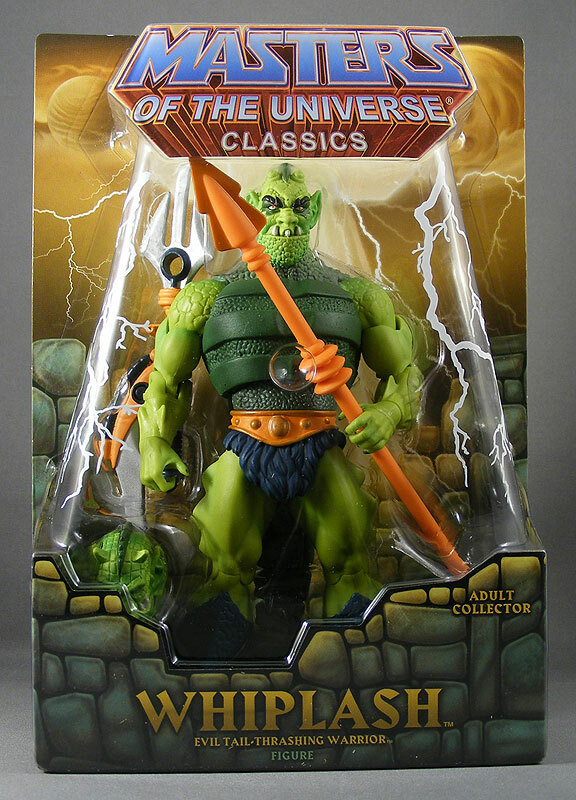 He’s a great, classic character, and now an excellent MOTUC figure. His only flaws are the oversized Millennium head, the loose left hand and some paint issues, for which I docked him a raven. * Somewhat sadly, I’d forgotten this fact when I sold off my vintage MOTU collection a few years ago. Most of the toys had been re-bought on eBay between 1999-2003, but that Whiplash was in the mix as well. I can only hope he’s now given a place of honor on someone’s display shelf, rather than being relegated to my parents’ attic. that is a shame about the left hand, but that's why they include those handy clear rubber bands, right? rubber band the weapon into his hand! Nice review! It will take a few weeks before Whiplash gets here. Still haven't received my SDCC stuff yet. While I agree that the Millennium head doesn't look right on the MOTUC body, I don't think it's because the head is too large as you (and Pixel Dan) have said. I think it's because the proportions of the body are all wrong to match that head. Basically I don't think making the head smaller would have helped any, which is what saying "the head is too big" implies. Whiplash is far and away one of the best looking MOTUC figures. Characters like Zodac, He-Man, and Stratos look embarrassingly dull and un-detailed in his presence. Still, I had him side by side with the Millenium version, and I was just blown away by how much more thoughtful the 200X version looked. Just looking at the chest and stomach muscles, the 200X version is beautiful. I love the feet and the hands that don't look like simple humanoid hands. 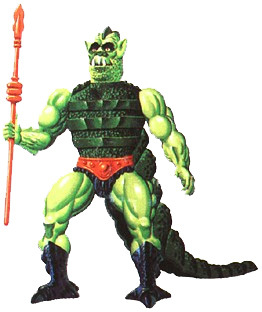 And his girth (tee-hee) would look amazing if it were translated into MOTUC size. 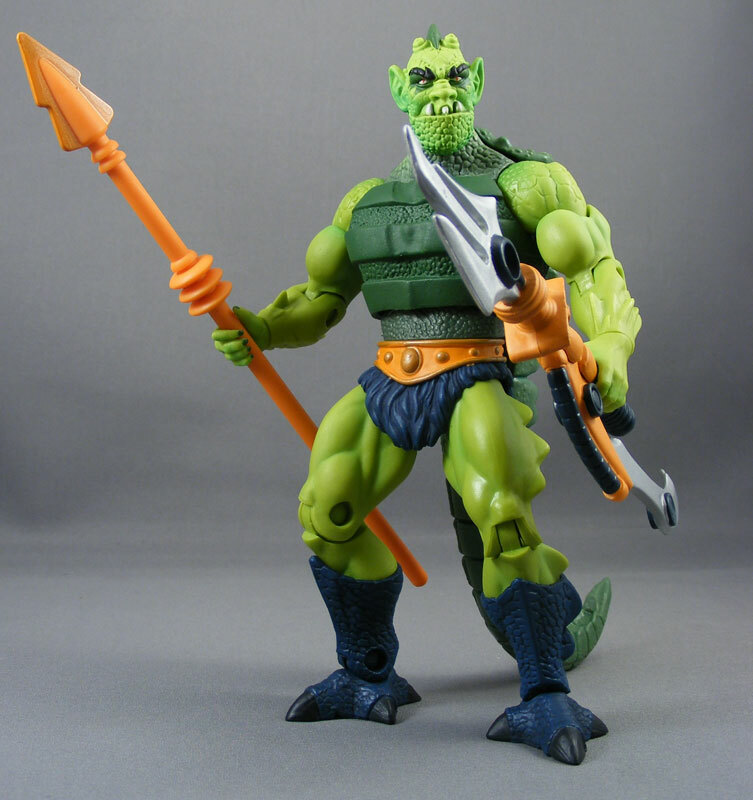 One of my biggest pet-peeves in MOTUC is that a bee-man and an alligator man would have the exact same proportions. And just to prove I'm not a total 200X-schill, I HATE that 200X weapon Whiplash has. It just looks bizarre and unwieldy. I think the .org calls the millennium weapon a trident staff. I do think that Whiplash is an awesome figure. I forgot to mention, my vintage Whiplash is also still in excellent condition as well, especially in comparison to my other figures. I never even thought of that! It took a couple of days, but I've warmed up to him. Sometimes a character shines when they are fun to pose. I'm a bit let down that I don't love the millenium head since I could never find that figure. I was hoping he'd provide me a post-millenium band-aid, like Keldor, She-Ra, Faker, and Moss-Man have. It's a cool sculpt though. I'm sticking with vintage, but if you pop the millenium head and weapon on there and pose him around for a bit, it still looks great. I have to agree with the sentiment that it is not that the head is too small, but that the millenium version belongs on a tremendous-sized body. not that i have this figure, but the vintage style default head just looks like a mess. it's such an odd and un-aesthetic design…i felt the same way in the 80s with my old whiplash…he just never looked right…and that third tooth is just blegh…whiplash was one of my biggest regrets when i sold off my 200X collection. i think buzz-off was the biggest…and trapjaw. damnit why did i sell those guys. It took a couple of days, but I’ve warmed up to him. Sometimes a character shines when they are fun to pose. That's how I was with Zodac. But after I played around with him and his little ray gun, he really started to grow on me. Now he's one of my favorite figs and I couldn't really tell you why. That may have been your best review yet. Great job Poe. Whiplash has been a quirky figure for this line. He didn't get much fan buzz on his reveal, or publicity leading up to his release unlike a lot of figures. Then the entire second head/200x controversy really came to boiling point with him, and then he's been getting some mixed reviews. It's sort of funny. Either way he's my favorite figure in the line after Skeletor and He-Man. That all being said, Whiplash is awesome. Easily one of my favorite MOTUC. He's the kind of figure that grows on you the more you play with him, and I think that's where a lot of the "so-so" reviews have been faulty; the reviewers probably didn't give Whiplash enough time and went off first impression. I notice this especially since it seems like most reviewers on this line are just trying to be the first one to review the newest figure. Either way, great review! And it's always nice and much appreciated to hear the personal side of toys, because without that emotional connection toys would be worthless.